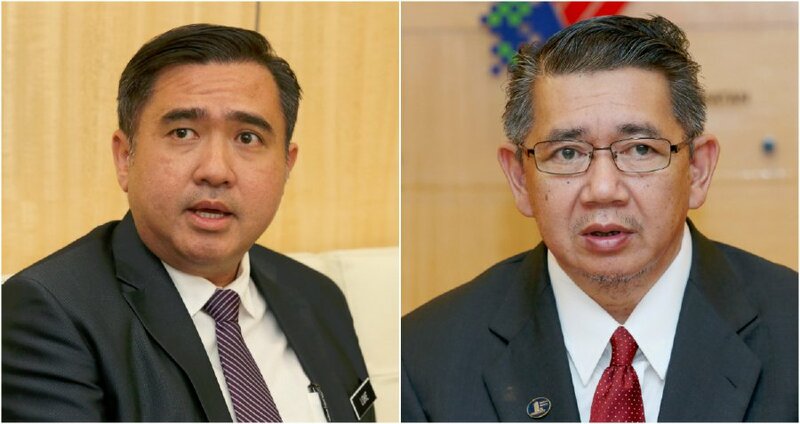 (From left) Transport Minister Anthony Loke and Agriculture and Agro-based Industry Minister Salahuddin Ayub. THE sound bites emanating from the newly-minted ministers from Pakatan Harapan have been easy on the ears of many people. Some of their utterances make many people excited, thus raising expectations as well. The are plenty of quotes coming from speeches, briefings and discussions in the past couple of weeks. One of the earlier quotes came from Transport Minister Anthony Loke, the DAP MP for Seremban. In the May 9 election, Loke beat BN/MCA Datuk Chong Sin Woon and Pas’s Shariffuddin Ahmad. Loke polled 55,503 votes, Chong 24,809 votes and Shariffuddin 11,506 votes. Loke told his ministry staff to go back to basics in their approach to work. He wanted them to focus on their job and not wait on him. The days when staff would wait in droves for the minister’s arrival for meetings or visits are over, said Loke. The instruction goes further. If required to accompany the minister to Parliament, only relevant officials are to join him. And this on a needed basis as well. While this is not a totally new approach, it is indeed a fresh reminder to civil servants in relation to their work routine. Over the years, a simple briefing or site visit often ended as a grand ceremony with scores of staff waiting in line to shake the minister’s hand. I’m quite sure the staff, too, would welcome such a directive. If this can be adhered to, we can expect better things from the ministry. However, Loke did have a long line of officials waiting to welcome him when he reported for duty. “No more ceremonies please. Let’s just focus on our work,” he said. Loke and PH created history by toppling the only Federal Government this country ever had, first under the Alliance and then under Barisan Nasional. It’s very important that civil servants adapt to a different political master. Both master and staff are on a short learning curve actually, but the people has only one concern — deliver! We must not forget PH’s declared objective in the run-up to the election — to strengthen and reform government institutions besides boosting integrity, transparency and efficiency. These is fine rhetoric. Last month’s election opened a new vista for the rakyat — it effectively threw out the fear of changing the government of the day. And this brings a new style of administration not seen before. Whether the PH administration can live up to its promises remains to be seen. Another PH cabinet member made an almost similar statement when meeting his staff last week. Salahuddin Ayub, MP for Pulai, who has been appointed the agriculture and agro-based industry minister, told staff to do their work diligently and fairly. He wrested the seat from then incumbent, deputy home minister Datuk Nur Jazlan Mohamed. He polled 55,447 votes against Nur Jazlan’s 26,523. Salahuddin has yet to smile, a senior staff member told me a few days ago. Apparently, the new man rode into the ministry with only one thing on his mind — get the work done. Surely a smile here and a smile there won’t adversely affect work, YB! “I’m a politician. But politicians come and go, as sure as night comes after day. But I want to make sure that none of you are subjected to extreme political pressure or threat from anywhere. Together, you and I must ensure that our duties to the people are carried out well and effectively. “I want all staff led by the secretary-general to do their work in the most trustworthy manner. This can help staff regain their pride and credibility in everyone’s eyes. I want to see the civil service regain its rightful place as a respected and trusted entity, just like it once was. “Your duty is to the king and country, first and last. You and I have a joint responsibility to make our country proud on the international stage. So let’s do that please,” Salahuddin said. I also found out one other thing at the ministry — there won’t be a “zero sum game” approach. This is very important. Many people feared that a change in government would result in the shutting out of businesses to certain quarters. In one of his early speeches to the staff, Salahuddin dispelled any thought that non-PH voters would be discriminated against should they seek the ministry’s assistance. Anyone, regardless of political affiliation, with a business proposition regarding agriculture and its related field are more than welcome at the ministry. Each would be considered on its merit, he said. As I said earlier, these sound bites make good listening. In the next few weeks and months, these words would be put to the test. There are now more watchdogs than ever, and all are eager to pounce on any shortcoming. Record-breaking Prime Minister Tun Dr Mahathir Mohamad is now the most-watched and scrutinised person in the government. He had his first taste of public opinion early on when he announced his cabinet line-up. He had announced that he would also take on the Education Ministry portfolio. But when reminded that the PH manifesto had stated the prime minister won’t be allowed to hold any other portfolio, Dr Mahathir quickly made the correction. Dr Maszlee Malik, MP for Simpang Renggam, Johor, was appointed instead. Ten or 15 years ago, Dr Mahathir wouldn’t have reversed his decision. But times, they are a-changing. Let’s brace ourselves for more surprises in the future — good, bad and ugly.